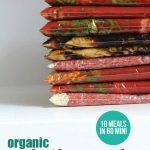 I was able to prep six make ahead freezer meals this week in 50 minutes (including clean-up!). 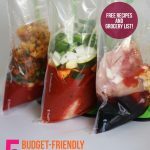 Here’s everything you need to know to do the same, including my recipes, grocery list, and best freezer meal tips. 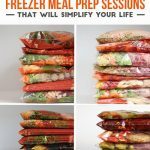 Before my third daughter was born, I stocked our freezer with 27 homemade freezer meals. After that, I couldn’t seem to get ahead again. Most nights I was more concerned with getting dinner on the table than stocking our freezer. 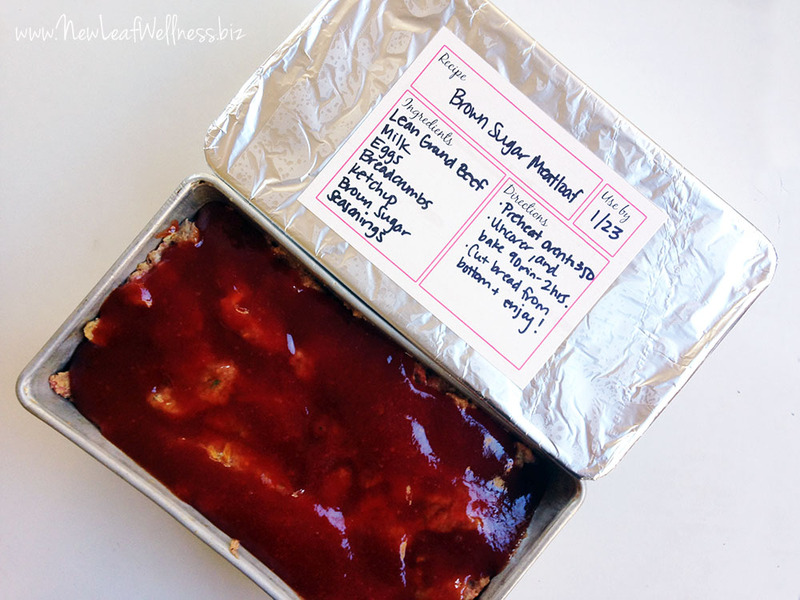 When my baby turned 8 months old, I jumped back into freezer cooking, and I’m so glad I did! Freezer cooking isn’t one more thing added to my to-do list, it’s the one thing that frees me up to do what I really want. 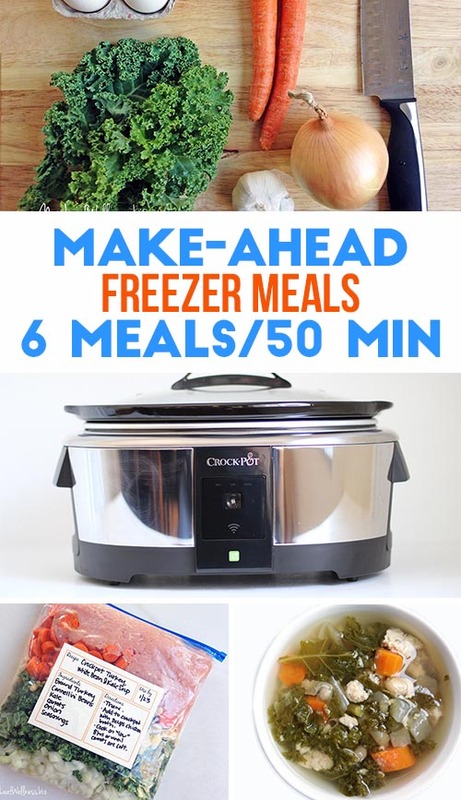 Take these six freezer meals for example. They only took me 50 minutes to prep (including clean-up). If I combine some of them with other meals from my freezer, I’ll be done cooking for the week! I froze all of the meals raw so they were very easy and quick to prep. Plus they’ll cook for the first time out of my freezer and won’t taste like leftovers at all. Wahoo! I had some of the spices and sauces on-hand, and bought everything else at the grocery store for $59.69. I normally shop around for coupons and sales, but I didn’t have time this week. We celebrated our 8th wedding anniversary and our oldest daughter’s 5th birthday, and I needed to do one huge shopping trip at a grocery store that would have everything that I needed. I can tell you that we’ve already eaten one bag of the honey sesame chicken and it’s delicious! One of my friends shared the recipe with me during a freezer meal prep party last spring and it’s one of the best chicken crockpot meals I’ve ever eaten. The brown sugar meatloaf is one of the most popular recipes in my No Cook Freezer Meals cookbook and the turkey white bean kale soup is a new recipe that I made up. I get out all of the necessary ingredients. I start with the fresh vegetables and prep all of them at once. Then, I work in an assembly line and tackle each recipe at a time, adding the meat to the crockpot meals last so it’s the first ingredient poured into the crockpot. 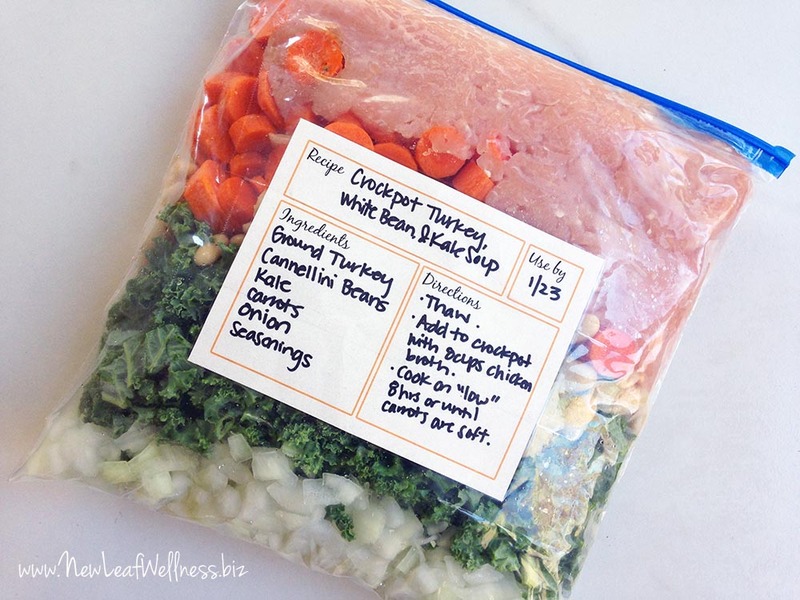 Most freezer meals will stay fresh in a regular freezer up to three months. When you’re ready to eat, thaw overnight in the refrigerator or in a bowl of water. Cook, and enjoy! My best advice is to jump right in and give it a try. Once you see how easy it is, you’ll be hooked. Questions or comments? Please leave a comment below. I’d love to hear from you! I am not sure how the turkey works. Does it cook up in a big clump? Do you break it up after you add all of the ingredients? Thanks. Yes, just break it up after cooking! Sorry I wasn’t more clear about that. Thank you! 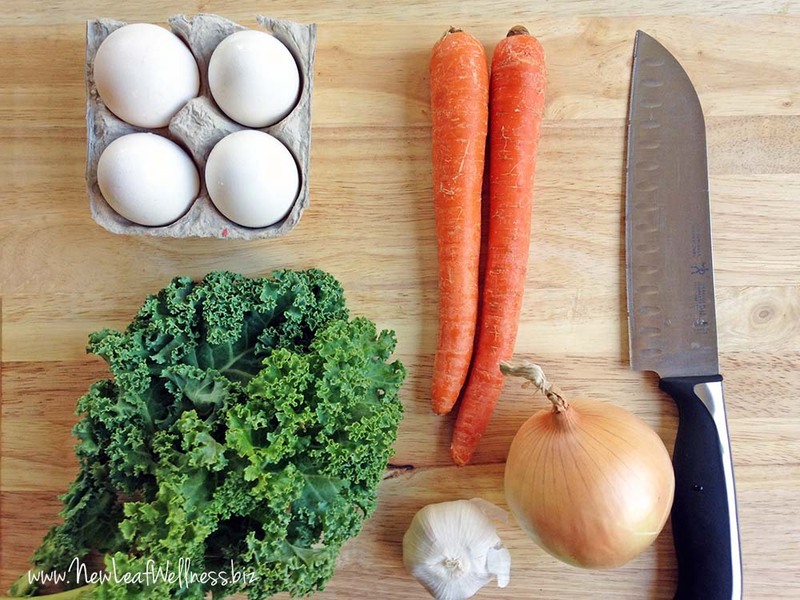 The recipes you have been sharing over at MSM have really jazzed up our regular menu. These look great! Thanks for sharing 🙂 Anything that makes meal times easier is a good thing. Great site! Love your recipes and pictures. Can’t wait to explore it more! Thanks, Meghan! I just started following you on instagram! Thank you for your freezer meal ideas. I really like the labels you put on your bags with the ingredients and directions. Thanks for the great recipes and tips. 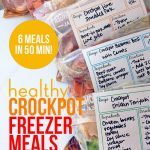 I’m wondering if you have tried putting ingredients in the crock pot while they are still frozen? I would like to put them in the crock pot before I leave in the morning and have them ready to eat at dinner time. What do you think? I would thaw them overnight in the refrigerator the night before. I don’t think cooking in the crockpot frozen is recommended, but between you and me it works. Just make sure you don’t try to fit a solid frozen square block into an oval crockpot. do you have each recipe listed indiv? Ilove your ideas! They’re all included in the pdf. Thanks, Corey!